Gaza’s battered agricultural sector has the capacity to recover but only if there is access to the buffer zone, and only if Gaza’s commercial crossings are fully opened, according to a recent UN Food and Agriculture Organization (FAO) report on Gaza. FAO says the area inside the buffer zone along the northern and eastern borders with Israel contains nearly a third of Gaza’s arable land, but it has been inaccessible to farmers, residents and UN agencies since 27 December 2008 (when Israel launched a 23-day assault on Gaza in retaliation for continued Hamas rocket-fire from Gaza into Israel). The width of the buffer zone is 0.5-1km along the eastern border and 1.8-2km along the northern border, according to FAO. The buffer zone extends about 55km along the length of Strip from northwest of Beit Lahiya to southeast of Rafah, but the area is not clearly marked. “In different areas there is a certain ambiguity regarding the exact border between Israel and the Strip,” according to an Israeli military source, who added that the fence that delineated the Gaza Strip today did not necessarily reflect the final border that would be determined by the two sides in a final status agreement. 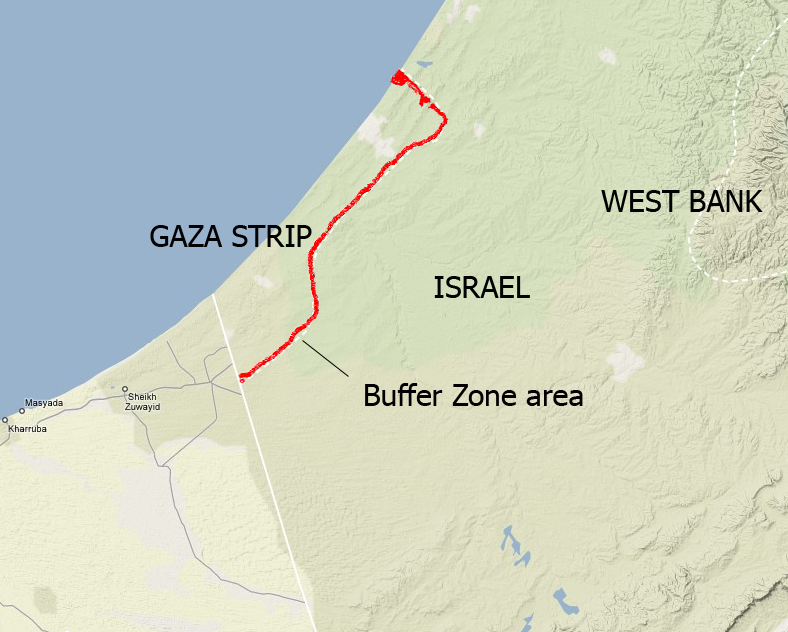 Israel's "buffer zone", in existence for over a decade, has been extended in recent years. Gaza’s agricultural sector has been severely affected by the recent Israeli military operation: Cultivated land, livestock, poultry farms and agricultural infrastructure have been destroyed. The use of weaponry and the movement of tanks and military bulldozers during the Israeli offensive destroyed 14.6 percent of Gaza’s total agricultural land, according to the Palestinian National Early Recovery and Reconstruction Plan for Gaza. Before 27 December there were about 16,997 hectares of agricultural land in Gaza, including about 1,214 hectares of greenhouses. The Plan estimates direct agricultural losses caused by the operation at about US$181 million and $88 in indirect losses. The buffer zone contains rain-fed crops including wheat, barley, beans and various vegetables, as well as olives, almonds and citrus trees, according to Gaza-based Palestinian Agricultural Relief Committees (PARC) officer, Ahmed Sourani. Most of Gaza’s animal production is concentrated in the zone, which also contains important infrastructure such as wells and roads, according to FAO. FAO says that even before the recent Israeli assault farmers faced difficulties using irrigation-water and had adapted production to rain-fed crops. The ability of Gaza farmers to produce food and generate income has been reduced by restricted access, while Gaza’s people are forced to pay higher prices for scarce fresh food items, according to FAO. “After the war, if I go to my land [800m from the border] I am in danger of being shot by Israeli soldiers,” said farmer Samir Abu Gumboz from Shujayah, whose farm - 2.6 hectares of lemons, potatoes, tomatoes and a well - was destroyed during the offensive. FAO, UN Development Programme teams and NGOs cannot access the area to conduct post-conflict assessments, or implement relief and development projects. It is unknown how much unexploded ordnance (UXO) remains on farmland. Reports of chemical weapons’ residues are being investigated by UN Mine Action teams (who are not permitted to speak to the press). Roughly two-thirds of the Gazan population is deemed food insecure, while unemployment is over 40 percent, according to FAO.